One of the best things about fire glass is that unlike wood, it’s extremely low maintenance. What’s more, when you’re using a natural-gas source, your fire pit glass is among the cleanest burning alternatives available. That said, even the highest-quality fire pit glass may require a bit of cleaning up now and then. This may be due to exposure to rain and snow, or incomplete burning of the liquid petroleum (LP) gas in your fireplace or pit that causes soot buildup. Additionally, plain old dust particles can accumulate on the glass over time, blunting their shine. In the bucket, combine all of the water and vinegar (50/50 mixture). Scoop the dirty fire glass from your pit and add it to the bucket (Hint: focus on the top layer and around the edges or near the burner). Use the scoop to stir the glass around in the solution to clean your fire glass thoroughly. 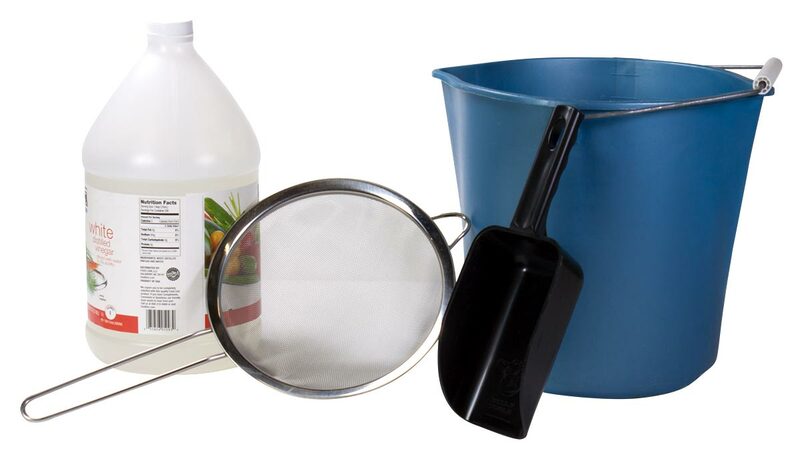 Remove the glass from the water / vinegar solution and place in the strainer. Give the glass a final rinse using clean water (a garden hose makes it easy). Particularly if you’re using the tempered variety, it’s a good idea to dry your glass completely prior to using it again. This is because leftover moisture in cracked pieces can expand when heated and produce a popping noise that might be jarring. To dry your glass, spread it out on a plastic bag or tarp. It’ll dry quickly in the sunshine, but can also be left overnight in a non-sunny area or even indoors. Do not reuse the metal strainer for cooking afterwards. This is because small shards of fire pit glass — not readily visible to the eye — could get caught in the mesh and pose a serious health hazard. It’s better to reserve the strainer for non-food uses and keep it somewhere safe, like a tool shed or garage. Do not use any types of soap to clean your fire glass – only use vinegar. Dish soap, and other soaps, will leave a residue/film which if not completely rinsed off will cause your fire glass to discolor when heated. Now that you know how to wash your fire glass, we’d like to remind you that once again, you’ve made an excellent choice in burning media. When used properly and cleaned regularly, your fireplace glass will retain its color and sparkling beauty for many years to come. Happy Burning!